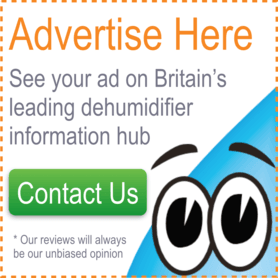 DeLonghi have been long established in the refrigerant dehumidifier market, with models like the DEM10 near the top of the sales charts for nearly a decade. However relatively new incomers such as EcoAir and their excellent DC202 have made huge inroads into DeLonghi’s market share. This review focuses specifically on the DeLonghi DES16E, part of their slimline DES range that also includes the DES12 and DES14. The DeLonghi DES16E is definitely the pick of the range as it’s the same size and weight as the DES12 and DES14, but has greater power (16L per day). The ‘E’ also denotes the electronic control panel the other two DES models lack. My absolute favourite feature of the DES16E is the digital control panel, featuring a humidistat. It isn’t particularly fancy, but it gives the ability to select a particular desired humidity, and then leave the rest up to the machine. 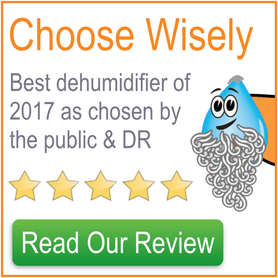 This is a vast improvement over the majority of dehumidifiers in the market that either have an analogue dial that goes from ‘min’ to ‘max’ or simply three options of ‘low’, ‘medium’ and ‘high’. There’s a viewing window into the integrated water collection bucket, but it’s a case of getting on your hands and knees each time to peer through it, with no other means of telling how full it is. The bucket has a three litre capacity, which is middle-of-the-road for this size of machine. There’s a lid on the bucket, which we appreciated, with having less chance of spillages. The bucket itself slides out of the unit easy enough, but frustratingly there’s no sort of handle on it, which means you have to hold it like the holy grail as you’re wandering over to the sink to empty it. As you’d expect, the machine stops automatically when the collection bucket is full. Of course, if you’re able to site the DES16E near to a sink you should utilise the auto-drain functionality. There’s a screw cap on the reverse of the machine that you unscrew to expose the pipe’s connection point. Thankfully DeLonghi are kind enough to include a lengthy 2m section of the required piping in the box. Because the auto-drain fitting is on the reverse of the machine, just remember that if in use, you will not be able to push the machine tightly against a wall, increasing the effective width of the unit. The DeLonghi DES16E comes supplied with a ‘Bio Silver Tech System’, which sounds like something my son would call his cardboard spaceship. It’s not nearly as complex as the names makes it sound. There’s a mesh filter coated in silver, which is only of a fine enough diameter to remove large items from the air, however its main function is to act as a biological filter. Silver is well-known to have antimicrobial properties, so airborne pathogens, bacteria and mould spores that come into contact with the filter should be immediately killed. This is certainly nice to have, however the one-part ‘system’ is not as multifaceted as some that are now available in the dehumidifier market. Refrigerant dehumidifiers have the inherent problem that they can become clogged up with frost. However, to mitigate this DeLonghi have pioneered an electric defrosting design, that greatly reduces/ eliminates (depending on temperature of room) down-time for defrosting. A really great feature. Just remember that while DeLonghi say that the frost protection device works to 2°C, your machine would be incredibly inefficient at these low temperatures, as it works through being the coldest spot in the room and allowing condensation to form. Refrigerant dehumidifiers are certainly not renowned for their portability, however, remarkably the DES16E very nearly bridges the gap to the lightweight desiccant types. It weighs in at a very respectable 9kg, which makes it the lightest mainstream refrigerant dehumidifier available and is only 3kg heavier than the lightest desiccant models. Having dimensions of 38cm wide by 49cm high by 19cm deep it is similar to the rest of the market. However it is narrow, which is probably the most important dimension as it makes it so much easier to carry and sticks out from walls and shelves less. On the point of carrying the machine, there’s a big ergonomic handle on the top of the unit that slots away when not in use and does its job nicely. Finally, caster wheels aren’t fitted as standard, but do come in the box, should you wish to make the unit easier to push around, rather than having to lift it. It’s good to see DeLonghi offering the choice here are there are pros and cons to having them. Design is always a personal thing, however we really like the symmetrical look, with the expanses of off-white plastic broken up by various details, the viewing window and the two inlets. We’re also happy to report the plastics are of good quality. When we got in touch with DeLonghi, they told us the DES16E produces between 38-42dB of sound while in operation. What has been found was something a bit different from that. 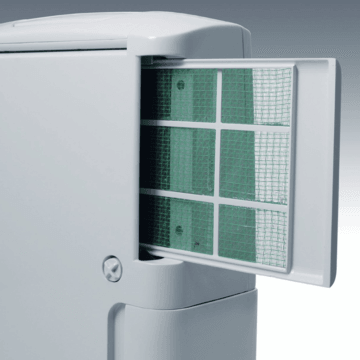 As with most refrigerant dehumidifiers, there’s a big difference in the audibility of the DES16E between it operating at full-power (such as a newly-introduced dehumidifier or when a long shower or drying laundry causes a spike in humidity) and on ‘tick-over speed’. On full power the unit is noisy, like a fridge that’s running, which drowns out the noise of the fans, but we don’t mind that too much as it’s to be somewhat expected. What we do pay great attention to is the noise during general operation, which with this machine is fine. In this case the compressor is quite quiet and it’s more the sound of the fans that dominate, which blends into background white noise easier. 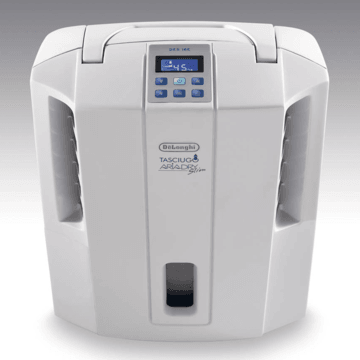 The DeLonghi DES16E tops the DES range in terms of daily extraction and a quoted extraction of 16L per day is towards the upper end seen in the dehumidifiers for the home. Don’t be fooled though, we queried with DeLonghi under what conditions this was tested and they came back with at 32°C and 80% relative humidity, which is totally unrealistic in the UK, although to be fair to DeLonghi, those conditions are very similar to the conditions other manufacturers rate their machines. So the good news is, you won’t be needing to empty the collection bucket 5.3 times per day (16 divided by 3). Extraction is again an area the DES16E performs middle-of-the-road. It’s not the best, but it’s definitely not the worst either. For a small to medium sized home it should do a decent job. 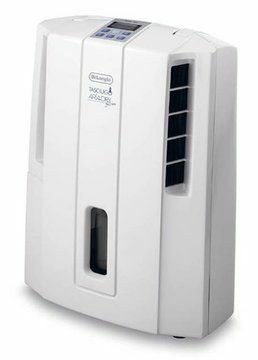 In summary the DeLonghi DES16E is a decent unit with a few main selling points: it is smaller than normal, it can be pushed up tightly against a wall (without restricting airflow) and it features an excellent electric control panel/ humidistat. The RRP of the DES16E is £199.99, however we’ve seen sales at this store take it well below that price, in which case making it a bit of a bargain and worthy of 4 out of 5 stars.